I wrote a ‘thank you’ note today, digging my fountain pen out of the drawer to do so. It took me back to a previous era (one in which i used my fountain pen often enough that i did not have to spend twenty minutes clearing the dried up ink and finding a new cartridge for it). Bad as my handwriting is, i was rather pleased with the effort, because saying ‘thanks’ feels good. I was reminded of this page from ‘Social Leadership: my 1st 100 days’. It’s one of the ‘Action Days’, around half way through the journey, when i talk about saying ‘thanks’. Part of Social Leadership is not having the answers, but creating the space, and respecting those who do. Most recently, i’ve been using really cheap plastic coins with groups, and calling them ‘coins of gratitude’: the group claim a coin by sharing a vulnerability, and can then spend it to someone in the room, or someone outside of it. It’s often a very emotional exercise, with tears and hugs. But the coins are worthless, at least if we measure worth in monetary terms. In fact, they are insultingly cheap and plasticky. It’s the value we imbue in them that counts: we create the value of the currency. Gratitude is cheap, yet priceless. See where you can spend yours. 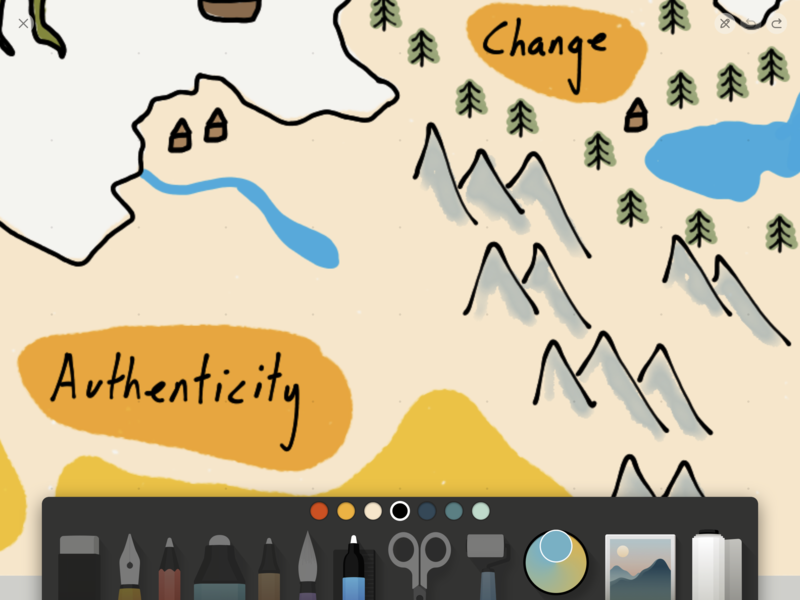 I’m writing a series of longer pieces, exploring my new Map of the Social Age for 2019: ‘Authenticity’ is a key location in this new landscape, representing, for many, a foundation of Social Leadership, and a central mechanism of engagement. We ‘believe’ in authentic leaders in a way that goes beyond pure contractual bonds. Authenticity forms the roots of that that engagement, spreading deep into our reputation networks. To understand the importance of Authenticity in Social Leadership is to understand that not all power is claimed: much is imbued. Authenticity is an imposed property: you can cut someone in half and it won’t say ‘authentic’ in the middle. It’s not measurable like height, or weight, and you cannot wear it like a coat. In some ways, it’s like beauty: others can perceive it in you, and no matter how much you aspire to it, you cannot buy it in a bottle. The easiest type of authenticity to understand is that which is based in experience: if we are talking about mountaineering, and you have climbed Everest, then your perspective, your viewpoint, is more authentic than mine. I may have watched a movie, and read books, but i have not lived it. I may even know more facts than you: i could tell you what the rocks are made of, i could give you the height in inches, and i could tell you how many steps it takes, on average, to climb it, but unless i have actually put my feet on the ground that ten thousand times, my story is not authentic. Authenticity is therefore imbued, experiential, and discretionary: you may have climbed Everest, but if i do not ‘believe’ in you in some way, i still may not count your viewpoint as authentic. It’s not just individuals who can be deemed to be Authentic though: it’s a quality that we place onto Organisations as well. But in the same spirit, it’s something imbued, not bought, or demanded. And if we have it, it really counts. 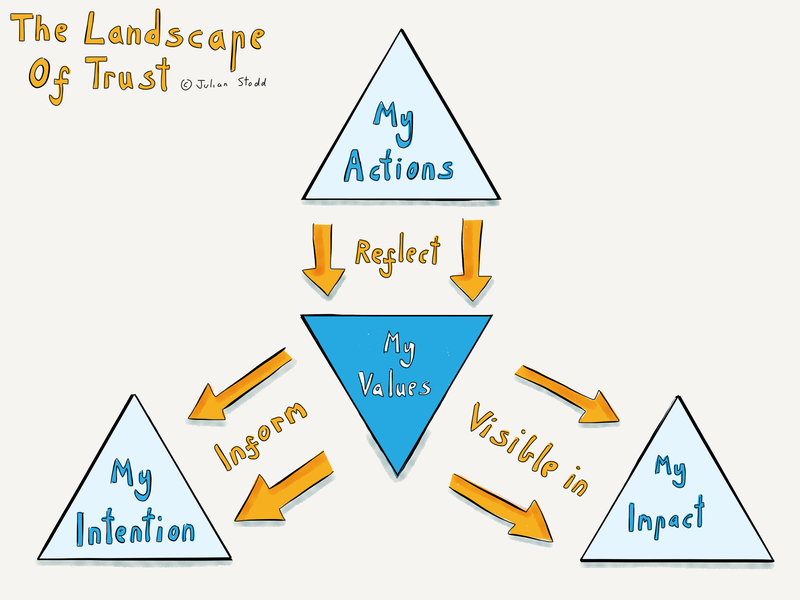 In the context of Social Leadership, it’s easy to see why Authenticity is important: when we move beyond our formal bonds, when we move outside of the hierarchy, then all that is left is trust, reputation, pride, and the other social forces of connection, and Authenticity may act as something of a catalyst for all of these. Authenticity is often a story of simplicity: an ‘authentic’ meal would often be a simple one, not heavily processed. A craftsman making a chair by hand may be seen as ‘authentic’ in their labouring, whilst a factory in Cambodia manufacturing clothes at international scales may not be. At least, may not be from a context of the consumer in the UK. Indeed, if the trendy brand that designs those clothes is discovered to be utilising child labour, any authenticity they have bought may be squandered. So it’s a currency, certainly, but not one that is easily traded beyond grounded experience. 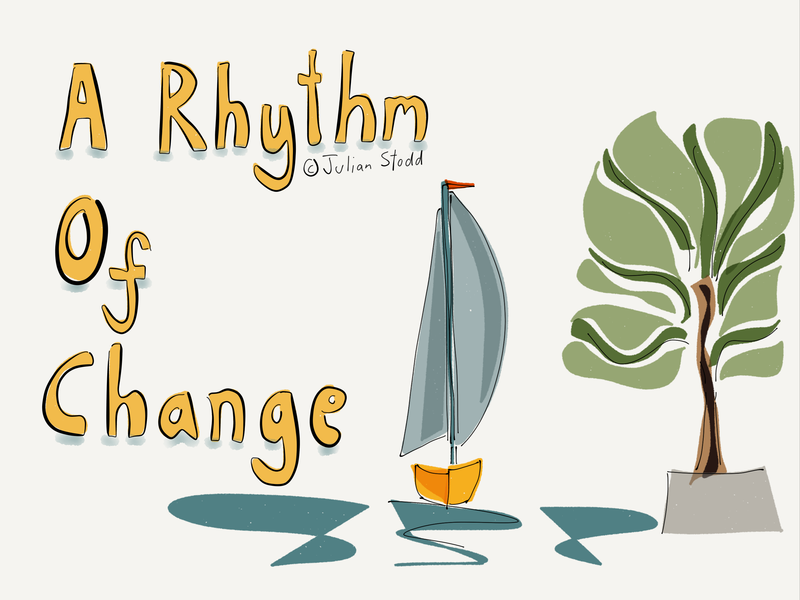 We could view Authenticity is an element of resilience, in the sense that, when we have it, we can weather a storm more easily: we can be authentic, and fail, and yet be carried to safety by an engaged community. We may be forgiven if we are authentic, even if we make poor decisions. But if we are inauthentic, we may be judged harshly. From a practical perspective, there are two things to consider: how we, as individual Social Leaders, can be authentic, even when Organisational pollution gets in the way, and secondly, how we can ensure that our Organisations themselves act with Authenticity, internally to their employees, and outwardly, into the community they exist within. The term ‘Organisational Pollution’ is one that i first used to describe the factors that inveigle their way between ‘intention’ and ‘action’, e.g. i ‘intend’ to act fairly, but in the execution, in the action that i take, directed in part by the Organisation, i act in ways that are less than fair (e.g. i don’t give you a 0.5% pay rise because my total budget for pay rises is capped, and so i award it elsewhere: i may have intended to, but action beyond my control prevented me, so my action is unfair as measured against my intention). Of course, much of this is contextual: i may believe that i am acting with Authenticity towards you, and you may believe that i am not. And hence your view of my leadership is that it’s not authentic. Indeed, i suspect that in almost every case, this is true. The world is not full of people who try to act without authenticity, and yet not everyone is deemed to be authentic. Authenticity is also contextual in another, more traditional, sense, in that our experience based Authenticity only counts in context: e.g. if we are discussing the gender pay gap, your experience climbing Everest is not really that relevant. So contextually, you are inauthentic. From an Organisational perspective, we must create opportunities of authentic engagement: this may include things such as facing our own failure, sharing weakness and uncertainty, as well as conviction and strength, listening more than talking, and engaging with honesty in issues that are most significant into our work, and local, communities. One of the reasons that i’ve included Authenticity as one of the key aspects for this year is because of the more recent work i’ve been doing on Dominant Narratives, and the amplification of failure. If we are deemed to be inauthentic, the consequence may not simply be local: it may be aggregated, and amplified, to be global. For that reason alone, understanding the importance and mechanisms of Authenticity, it’s roots in experience and action, and an active approach to building and maintaining it, for both individual Social Leaders, and engaged Organisations, is important. ‘Authenticity’ is valuable, intangible, contextual, and imbued upon us by others. We cannot demand it, nor insulate against it’s loss. Consequence of losing it may be aggregated and amplified at scale. Consider the roots of your own Authenticity: what action do you take that grows it, and what erodes it? Consider if you can create conditions, circumstances, for people to engage in ways that permit them to engage with Authenticity? The Social Age is a time of rebalanced power: in this, the ninth in a series of articles exploring my Map of the Social Age for 2019, i want to consider ‘power’. The structures it’s held within, and the dynamic tension between formal and social spaces. A central context of the Social Age is a rebalancing of power: the historic structures that power is held within are significantly eroded, whilst in parallel the mechanisms by which it flows are diversified. For example your employer used to hold significant power over you, but in a time of fragmented and portfolio careers, they no longer do. The consequence of losing your job is diminished in a time when Organisations regularly make people redundant: even loyal and ‘good’ people. And a social movement you start that gains 100k followers hold significant power outside any formal system. So power is held differently, and moves differently. Indeed, in one interpretation, power itself has fragmented, away from one dominant formal type, to multiple different flavours, triangulated between charismatic forms, hierarchical ones, and reputation based ones. Whilst my own understanding is imperfect, i’ve certainly come to view most of the functioning and coherence of social structures in terms of understanding power: particularly the gradients through which it flows, and the ways that the movement of power impacts on the evolution of Dominant Narratives. The idea of a Dominant Narrative is simply ‘the way that things are’. A simple example would be this: in Victorian England, the role of women was domestic, and to be seen, but not heard. Today, that is no longer the case. Indeed, the Victorian notion is largely comical in how distanced it is from our everyday reality. And yet both were equally true in their own time: for Victorian men and women, the Dominant Narrative was simply ‘how things are’. And today, that version of the truth is precisely ‘how things are not any more’. As we stand today, approaching what we can only hope is the crest of the #MeToo movement, we can look back at this shift in terms of a gradient of power: historically working in systems controlled primarily by men, and increasingly (although by no means exclusively) by both men and women, equally. Whilst the journey is not complete, the power gradient has shifted, and done so in two significant ways. Initial evolutions of power may be by consensus, where an established, or dominant, form ‘permits’ certain freedoms. But transformation may come through fracture, where a minority group simply claims the power: it’s this claimed power that we see in the #MeToo movement, which is why it’s so fascinating to observe as a social movement, and has the potential to shift the Dominant Narrative. But only the potential to do so. Shifts in power are governed by two key factors: cohesion, and response. The #MeToo movement is united in opposition to oppression and harassment, but disunited in terms of what outcomes may look like. And the dominant patriarchal model of power is pragmatic enough to ‘permit’ (i use the word carefully, but deliberately) change, but possibly not a full evolution of the Dominant Narrative. In other words, we may end up in a world that is more balanced, but still fundamentally patriarchal, just dressed up to be more equal. Dominant power will typically relinquish just enough power to ensure that it remains in control. Some types of power can be directly opposed and diminished, whilst others, if you oppose them, are strengthened. For example: Julian Assange is legally pursued by the US government, but that very legal jeopardy makes him a social hero in some quarters. Almost all Islamic Extremism falls into this category: our very efforts to prosecute it through force reinforces the self validation and belief that spawned it in the first place. In a very real sense, our opposition validates it and makes it stronger. So you can use direct force, hierarchical power, to bulldoze a village, but you cannot use it to remove the horror and outrage of the displaced villagers. Similarly, you can use formal power to restructure an Organisation, buy you cannot remove the betrayal and frustration of the employees. #MeToo represents claimed power, in that any woman, anywhere in the world, can take action, and tag it #MeToo. So the structural basis of that power is not hierarchical: nobody ‘permits’ you to claim #MeToo. There is no membership card. It’s a reputation based network of power, that can jump across barriers. But this type of power is open to pollution: it can be gamed, influenced, subverted, although it’s remarkably hard to counter it. If a group of white, male, middle aged, record company executives put out an impassioned plea to ‘stop the movement’, i doubt they would do more than stoke the fire. This movement is driven by an impassioned group who have just discovered that their power is very real, and almost unanswerable. In the Social Age, the emergence of a broad category of aggregating and amplifying technologies have hastened this shift: we are radically connected and aggregate around common views or themes, partly determined by what is amplified into our network in the first place. If you look at the emergence of new technologies, or the adoption of new games, the cycles of adoption (and collapse) happen ever faster: just look at the adoption and growth of Pokemon Go. Can you imagine trying to ‘push’ that type of effect through a system? No: it was amplified, and traversed as a compelling story between spaces, gaining power as it went. And once it had power, some of that power (held in engaged community) was translated into a different type of power (money, held within financial systems). Power does not exist in isolation: it can convert into different forms, but they are not all compatible. For example: if i have a lot of money, and give much of it away to good causes, i may lose money, but gain reputation for philanthropy. But if i spend that money trying to bribe you to like me and tell others that you do, i will still lose money, but will likely gain a reputation for duplicity. The very act of me trying to influence the reputation economy with financial currency destroys the currency. When we consider storytelling, we can consider power as well: what type of power ‘pushes’ your story, and what type of power ‘opposes’ it? Do you tell it with a ‘formal’ voice, or is it pulled through the system because of your authenticity? Or both? 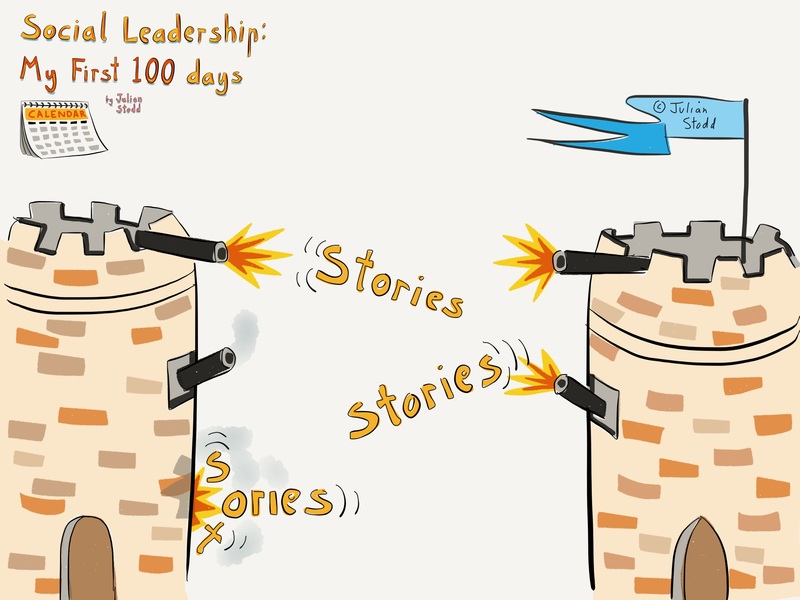 People typically say that ‘authentic storytelling’ is one of the top things they look for in a Social Leader, so we could consider that Authenticity is itself a real type of power. Over the last seven years i’ve written various research pieces exploring power, and especially the limitations of formal structures to cope with reputation based authority: it tends to fracture or shatter them, when it hits from the side. One reason it does this is because formal power is often undermined by ambiguity: a lack of certainty or definitive action at speed is deemed a weakness, whilst in fact it’s often rapid, but incorrectly framed, action, taken too fast, that leads to failure. When we look at a system, we can view it through different lenses: imagine that you are in a helicopter above a town, looking down. You an understand the place as a network of buildings, and roadways that connect them. Or you can look at supply versus consumption: you could understand the city by seeing places where consumables are stored and distributed, and restaurants and bars where they are consumed. This latter view would be superimposed upon the former, but it’s a whole different way of looking at the town. You could view it through political power: highlighting in red the buildings where conservative voters lived, and blue for the liberals. You could see if the Town Hall was red, or blue, and hence understand who is empowered or disenfranchised by the dominant view. All three views of the town, all three ways of understanding, would be concurrently valid. And a hundred more besides. That’s how social systems work: we can understand them in terms of multiple concurrent structures of power, some of which are clearly connected, either in amplification or opposition, and others of which are almost entirely hidden or subversive. 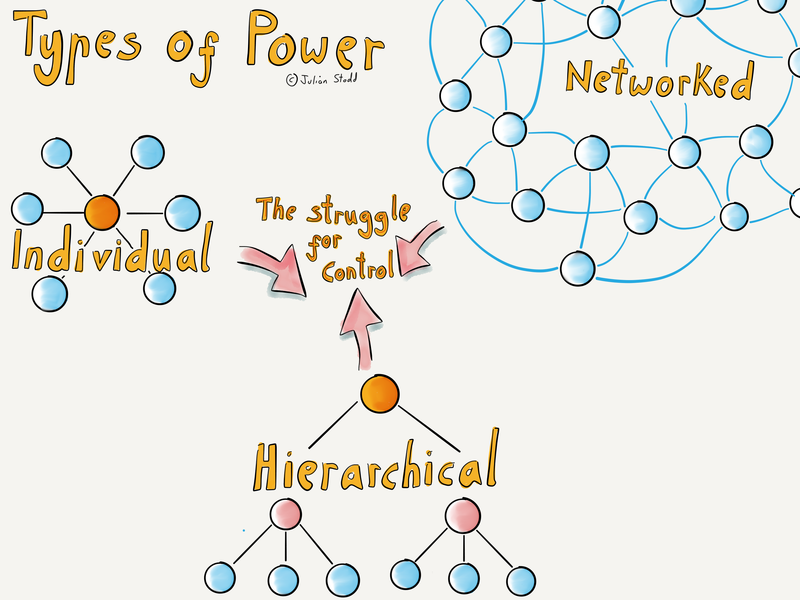 Understanding structural power, and specifically the ways that different types of power interact, is a valuable lens for understanding the true context of the Social Age: understanding how these structural power relationships are evolving is a differentiating one. There are many different types of power: some amplify each other, whilst others deny or fracture each other. Social systems are radically complex, and can carry power in unexpected ways. Power does not always flow in a linear way: some types of power can leapfrog, or transmute. Clearly understand the limits of your formal power, and strive to understand the basis of your Social Authority. Develop the capability to view the complex social system through the lens of power: sometimes the way to achieve greatest effect is to switch the type of power you utilise. 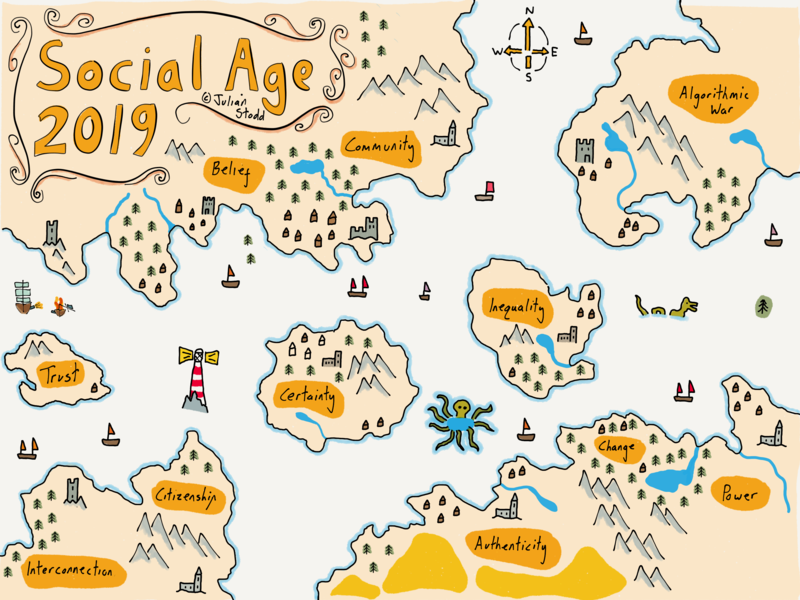 This is the eighth in a series of articles exploring the new Map of the Social Age for 2019. Today, i’m considering ‘Interconnectivity’, something that has emerged as a new, and powerful, notion within my own work over the last 12 months. When i talk about a more Socially Dynamic Organisation, i use the term to describe a future state: the Domain based Organisations of the past carry a phenomenal codified strength, but struggle to change, whilst a Socially Dynamic one will carry a different type of DNA within it. It will thrive in constant change, because it is engineered to be lightweight, scaffolded, and reconfigurable to need. And part of that scaffolding will lie in the ways that it is interconnected, at scale. The formal structure of our Organisations are clear: teams, divisions, domains, all regulated by formal power, consequence, and communication, but the social structure differs in key ways. The predominant level of social organisation is tribal: smaller collections of people, bonded by trust, pride, respect, often local to each other, or able to claim private space to engage in those rituals of sharing, gifting, exchanging, that help the social structure to bond. A global Organisation is made up of many different, overlapping, tribal layers. When we shape our views, share our stories, reach out to influence, we do that within our known tribes and communities, as well as crossing over into unknown ones, but the way that those stories land will differ according to the space. Within communities of consensus, it may be welcomed, whilst in communities of dissent, it will be opposed. One dimension of this is well understood: echo chambers, a confirmation bias effect whereby views are self referentially reinforced, although generally it’s used in a derogatory term for a view or community that we wish to diminish. The reality is that virtually all of our knowledge and understanding of the world is held in self referential constructs, piled one on top of the other. There is a reason we do this: because unity of the group is important. Because we fear being outcast. Because a moderated view, where we silence dissent in favour of conformity and membership, is the way that we keep our social structures together. We can differ in some ways, but not in every way. Pragmatism is both a toxic force (when we tolerate toxic behaviour) and a binding one (when we silence minor differences, in service of greater unity). Membership of a group requires conformity, and the silencing of vocal dissent. Stories, knowledge, influence, all flow most easily within established tribes, coherent communities, but as Social Leaders, we have a responsibility to hear weak voices within the system, to connect up between spaces. To interconnect. The context of the Social Age facilitates connection at scale, but possibly through the radical scaling of existing bias and imbalance. The role of Social Leaders is to connect diagonally, across the fault lines. To do so requires connection, to find the voice, and humility, to truly listen. Interconnection is not about stronger connections between known structures, but rather it’s about diversified connections between often poorly understood or even hidden ones. And it’s not just within Organisations: a key feature of interconnectivity in our understanding of the context of the Social Age, is to understand how people may become interconnected outside of any formal Organisation at all. It’s easier than ever to find like minded people around the world, and to create new communities, hidden from any formal power. 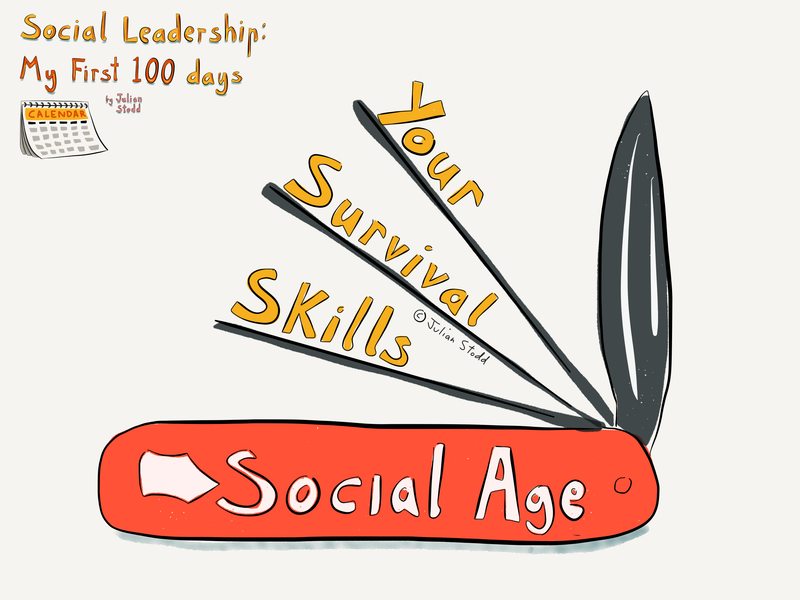 The Social Age is a time or radical connectivity, in terms of volume, but our challenge is to interconnect, to made meaningful connections in terms of depth. Not just how many, but how good. We are relocating from a space of certainty, to a place of doubt: our domain based Organisations, with the systems of education that feed them, and the markets that sustain them, all evolving. This is not a time for answers, but rather a time for questions, and to consider the mechanisms of sense making that will help us to ask the right ones. 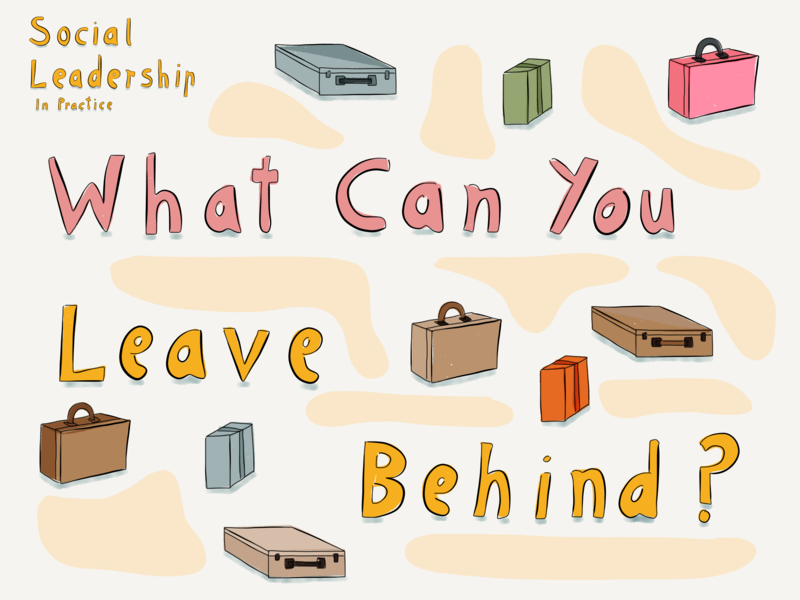 At heart, a curiosity, a willingness to ask not simply what we can carry forwards, but what we can leave behind: systems, processes, beliefs, and power. It takes a certain humility to ask these questions. When we are conditioned to frame situations, and find the meaning fast, to maintain ambiguity, uncertainty, and doubt, for protracted periods, can be hard. But remember: the winners will not necessarily be the ones that find an answer fast. They will be the ones that find the right questions. This is the seventh in a series of a dozen essays based around my new Map of the Social Age for 2019. The map illustrates some of the key areas i’m looking at this year, but is not definitive: this is iterative and cumulative work. Today, the notion of nation, and new models of citizenship, as we explore the mechanisms of engagement in society at scale. The Social Age is presenting us with new models of social organisation, new mechanisms of belonging: emergent structures of power that exist beyond the old footprints of the physical Organisation, and geographically defined nation states. The rise not simply of large companies, but of ‘transnational’ Organisations which exhibit many of the traits of historic nation states, and whose future trajectory is far from certain, but certain to be far from normal. They are disrupting the very notion of ‘nation’ itself, both in terms of how we ‘belong’, and how we are protected. To what do you belong? I am a citizen of the United Kingdom, which gives me both legal protection, a geographical home, and a set of cultural norms to which i am expected to subscribe. Citizenship tends to fall as a backstop to the everyday, not something we necessarily think about, but certainly something we take for granted. But the notion itself has been remarkably fluid over time and, i suspect, is evolving fast in the context of the Social Age. Citizenship is a membership status: you can be within a country, but not be a citizen, whilst, conversely, when i travel to the United States, i am still a citizen of the UK. Unless the United States confers citizenship upon me: citizenship is not necessarily binary, some countries permit dual citizenship, so you can concurrently be a ‘member’ of two states. But not all: some are incompatible, and taking one will cause you to lose your original status. On occasion, a State can lose it’s country, when a regime is displaced or a country is annexed, leaving people with citizenship, but no physically defined state. A ghost of a state. In law, nobody can be left Stateless: we have to belong to somewhere, or something: a country cannot remove your citizenship unless you have (or are eligible for) citizenship of another state. The origins of citizenship go back to ancient Greece, and the emergence of the polis, the ‘city states’, which were both physical cities, and political institutions (‘politician’, ‘police’ and ‘policy’ all deriving from this common root). But whilst ancient in institution, citizenship itself has always been remarkably fluid, and often a matter of convenience, a tool of power for the dominant caste. A mechanism of deliberate exclusion: you could be ostracised, cast out, castaway. Today, you can already by a digital citizen of Paris, or Estonia, but this is largely a definition of a service offering provided for a subscription. 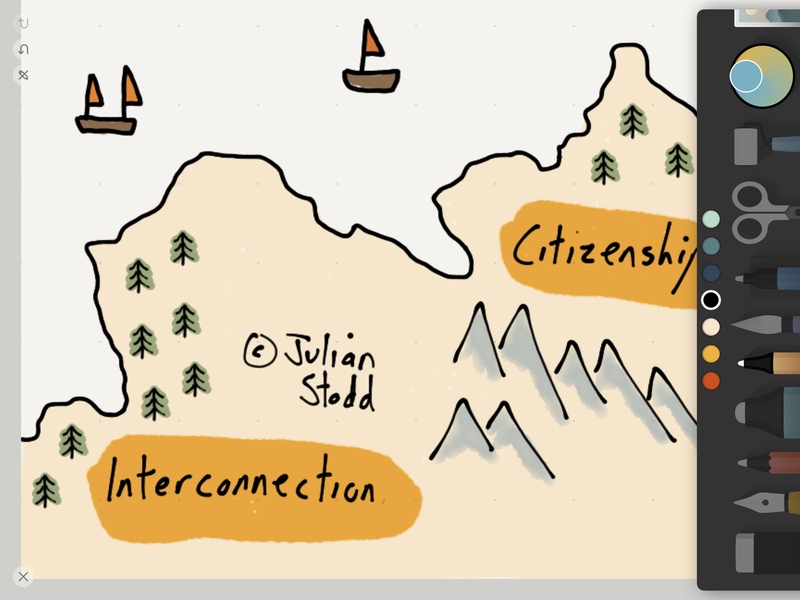 My premise for including ‘New Citizenship’ in the map of the Social Age for 2019 is this: that historic nations are losing relevance in the face of evolved models of membership to transnational entities that provide more than simple utility. They are spaces to belong. You could argue that ‘nations’ have originally been defined by two key elements: the constraints of geography, and the limitations of communication systems. Distance has been defined by how far a horse can ride, before it meets a mountain, and communication has been constrained by the limits of how far we can see, or stretch a cable. But today, distance is largely eradicated (we can get pretty much anywhere, fast), and communication is essentially synchronous and democratised (whilst historically it was ‘hard’ to communicate long distance, today it is ‘easy’, so where limitations exist, they are limitations that are imposed: somebody does not want you to talk to someone else, so they block it. The limitations of transport and communication are now largely political or financial, not technical. I wrote a piece last year, called ‘Citizen of Apple, State of Lego’, exploring what may emerge, beyond the notion of nation. I’ve used the term ‘Transnational’ to describe an entity, an Organisation, but of a fundamentally different type: these are the infrastructure providers of the new and emergent world. They are providers of utility, for sure, but also more than that: they are often entities to which we belong, in a meaningful way. When someone sits behind their MacBook in a cafe, they are making a statement beyond simply function. Brand is, of course, exactly this: imbued meaning, meaning which is created, and invested, in the inanimate. Or in the individual. Our emergent tech leaders hold power well beyond the functional role they serve within a hierarchy: they are the priests of the new religion, often heading up their own cult. They are politically powerful, and not simply within a system of established politics. I might argue that the Transnationals represent a dominant, emergent, new mode of social organisation, one which may supersede geographical nations as the primary anchoring space. We may be a citizen of brand before we are a citizen of state, not least because whilst States provide functions of utility, brands provide functions of self actualisation, and identity. In the old world, there was a contract: Nations provided security, and utility, in exchange for taxation, and the bonds of citizenship (conformity). But in the new world i am spoilt for places to engage: subscription is the new mechanism for provision of cultural input, security is privatised, or digital, and nobody cares about utility beyond plain function: we care more about whether it’s ethical and sustainable than we do about whether it works. We have been spoiled by reliability to a point where the market has moved on. It was telling that, in the first months of Trump’s presidency, when we saw a certain rolling back of liberal civil rights, it was the so called ‘Sanctuary Cities’, and States, as well as the Transnationals like Apple and Google that said ‘we will protect you’. As politics in the national realm falls to bipartisan conflict, from billionaire cabinets, it’s no wonder that new mechanisms of unity will emerge. At a practical level, this is important for Organisations to understand, because the engagement that we hold, from staff, and from customers, is of a new type: it’s a willing investment. It’s a discretionary engagement. And it may increasingly form a real type of power. 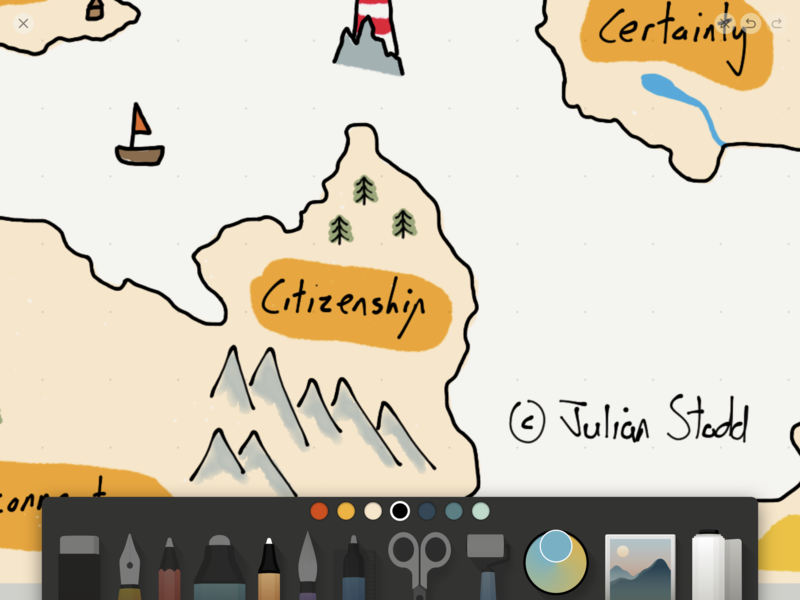 New citizenship relates to other key aspects that we have explored already: the Organisation as a belief system (and citizenship the honour that is conferred when you ‘believe’), ‘trust’ as the glue, held within society. But will the fight be one sided? Will nations fight back? Well, they already are: taxation, regulation, competition law, these things are all tools of the state used to regulate behaviour. But will they win? Harder to say: at a time when the economy of the Transnationals outstrips many smaller countries, as well as much of the invested engagement of society being in the emergent cultural inputs of Game of Thrones and Apple, it won’t be an easy fight. Possibly ‘nations’ will retain ownership of the battleground, but lose the actual war: just look at the recent battle over whether Amazon would locate a second campus in New York. This is not just a story of bricks and mortar: it’s a battle of identity and culture. The crux will come when the emergent Transnationals really reground their power in the established geopolitical sphere: not new products and services, but new models of culture and engagement. For example, not retailing within known models of shopping, but redefining our relationship with ‘stuff’, not competing in known transport networks, but redefining transport, not competing with hospitals, but redefining our relationship with our own health. These are not known evolutions of a known space, but rather foundational shifts. Education, health, transport, banking, these will all fall to emergent models: diversified ecosystems of technology, performance enhancing, offered as experience, offered as alters of belief. And as they shift, the shift will be increasingly global, interconnected, rapidly evolving, and challenging to older models of power that are grounded in their physical location, and ownership of infrastructure, at a time when infrastructure is fragmenting, personalising, and distributing. The old model of ‘tax for security’, ‘membership for utility’, is being outpaced by ‘subscription to culture’, and ‘artefact as identity’. Many of us will end up a citizen of multiple states, each bringing utility, some holding belief, many impacting culture. The old notion of ‘nation’ was defined by communication and transport technologies that have evolved. The emergence of the Transnationals is a new form of Organisation and hence power. If States abandon their primary function of security, and adopt one of utility, then they may be superseded by entities that are belief based, and welcome engagement. Or maybe you need to focus on engagement, and recognise how much of it is held within invested belief. 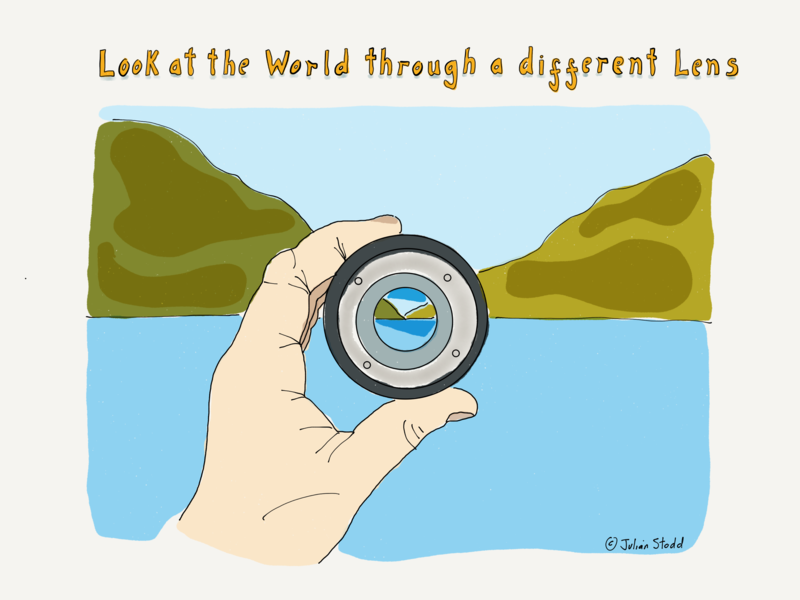 Perhaps this map is not yet clear, but pick up a new lens, and look at the world around you. What is really still the same?